“If something doesn’t suit your needs, just change it” – I love that concept. Would love to see the write up on that project. Uh… yeah, I’m gonna need to see a writeup on that. I’ve seen these food pedals stuffed into an actual guitar, as well. Everything – EQ, phaser, chorus, overdrive, distortion, was hidden under a pickguard with a million buttons and switches. +1 I always love to see people “hacking” existing hardware to suit their needs. Especially if it’s guitar related. 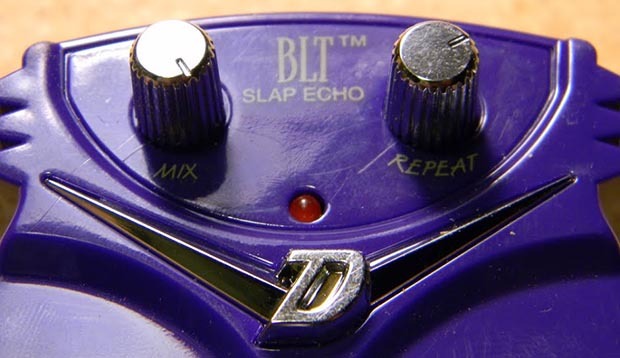 The echo duration on the pt2399 chip used in this pedal can be controlled though a current sink on pin 6, just be careful not to connect the pin directly to ground when the pot is fully closed or you could latch up the chip and need a “reboot” (switch off and back on) to make it work again. Someone warns about damaging the chip as well but I have no data about that. Anyway Princeton Corp (the chip manufacturer) states 1K as the minimum guaranteed value for the resistor to ground, therefore it is advisable to add a 1K resistor in series with pin6 and connect the center pin of the pot after that resistor. Wow great info! Thanks qwerty! You said that here are a few more mods possible with this pedal. I would be interested in changing some of the resistors on the filter for a better sound. Could you tell us more about this mod?